I think I may be one of the few food bloggers that wasn’t overly impressed by Ina Garten’s latest cookbook How Easy Is That? Don’t get me wrong, I love me some Ina and there are definitely some recipes in the book that I am looking forward to trying. It’s just that overall, this book has a much lower percentage of recipes that pique my interest than many of her past books. The book has sat on my shelf largely ignored since I pre-ordered it with such excitement back in the fall. 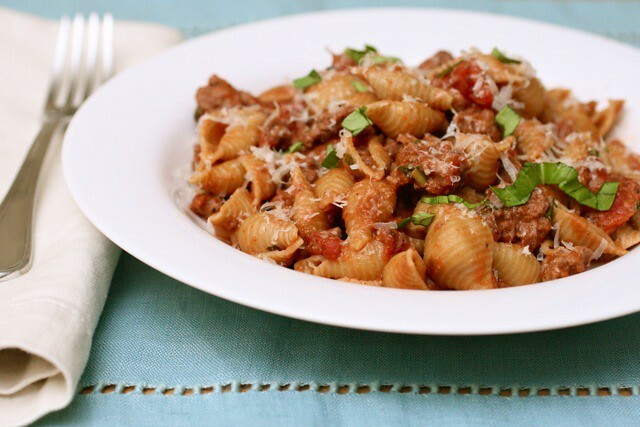 Finally I decided it was time to get some use out of it, and so this weeknight bolognese went on our menu. Heat the olive oil in a large skillet over medium-high heat. Crumble the ground meat into the pan. Cook until no longer pink and starting to brown, 5-7 minutes. Stir in the garlic, oregano and red pepper flakes and cook until fragrant, about 1 minute. Add 1 cup of the wine to the pan and stir, scraping any browned bits from the bottom of the pan. Add the tomatoes, tomato paste, salt and pepper. Bring to a boil, reduce the heat and let simmer for 10 minutes. Meanwhile, cook the pasta in a large pot of salted water according to the package directions. While the pasta is cooking, finish the sauce. Stir in the nutmeg, basil, cream, and remaining ¼ cup wine. Simmer for 10 more minutes, stirring occasionally until thickened. When the pasta is cooked and drained, toss with the warm sauce and grated Parmesan until well coated. Serve with additional Parmesan if desired.